From 1982: the collective who designed this poster had association with some people I knew in the 1970s. This is handy. My “Wollongong Decade” is in red. When my father lived in Illawarra and Shellharbour is in blue. The period in which we regularly visited family in Wollongong and Shellharbour is in purple. 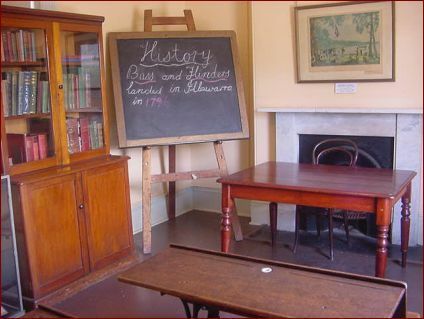 Classroom exhibit Illawarra Museum. I did take an interest in local history. Not every city has its own national anthem. But to us it’s Wollongong! This ritual occurs once a term, or twice a year, or once a year — depending where you are. It is often a mad round of quick interviews by the end of which one has forgotten who one is, let alone who one is talking to or about whom one is talking. “So, what have you got against my son?” I came at the end of a round of hairy interviews, it seems. An entire interview with an intoxicated parent which was mainly about the best brands of sweets. The parent was a grocer. “You tell me when he’s not behaving and I’ll bash him.” — I was from then on very sympathetic to the student and never took up the offer. “Mine’s the blonde one. You know… What’s wrong, Neil? Don’t you remember people you have met at parties?” — That was in fact the Principal’s wife playing a trick on me. I had only ever seen her once before. I did indeed teach her daughter, but “the blonde one” was a touch unhelpful as an identifier in that particular class. (Not from the 1970s). An entire interview devoted to the difficulty of living in Australia without servants! I will mix these up chronologically and won’t identify which school was concerned. There were indeed some funny things happened during my Wollongong Decade. One I told you of recently. It was the seventies, remember, and I must add that I have never been into illegal drugs, though I have tried marijuana – in Wollongong, naturally. What would you have done? These days I would have been obliged to call the police, but knowing that the students wouldn’t have come to see me. Then I simply invited them in, got them water and prepared coffee and waited, ready to call an ambulance if things went badly. Fortunately they didn’t and after a few hours they left. Yes, I did make a point or two about the folly of what they were doing. Odd things used to happen when Year 12 left. One year I was kidnapped by a group of them and taken to a rather swanky home where I was plied with food and drink. They released me eventually. This happened when I was brave or foolish enough to go to a Year 12 “Informal” – I was invited. It was, if I remember correctly, at the North Wollongong Surf Club. Well, one rather let one’s hair down and I had a good time. It was a touch embarrassing though turning up for breakfast on the front lawn of one student’s Mangerton home. Mangerton is/was one of the more select suburbs. Mrs D took it in her stride. One day a member of the English staff disappeared. This was just one of several bizarre events that year, which led to questions in parliament. We later heard she had eloped with a reporter from the local newspaper. One staff member was around 22 and rode a World War II Harley Davidson, dressing to match. Otherwise he taught English and History. He was on good terms with “Animal” and other noted members of the Kings Cross biker scene. He had a wonderful place on the river at Minnamurra, a short swim (almost a walk at low tide) to the sandspit and beach. Many a good staff party happened there, and one warm night swimming was definitely the go. It wasn’t low tide, though, so he rowed across with his assortment of English teachers. I recall one Brian being counselled about guarding his Catholic manhood as in the then state of undress he stumbled getting into the boat almost bringing the gunwale into firm collision with his private parts. It’s not a good idea, kiddies, to go surfing in the dark, especially when intoxicated and there are sharks about. He was in fact rather popular, but when a child especially annoyed him he would, after several warnings, grab everything off the child’s desk and throw said belongings (but not the child) out the second floor window. He would then send the child to collect them. I got quite a shock when I first witnessed this. I am sure conservatives would see this as evidence that schools today have declined in comparison with 30-40 years ago. A large batch of 78rpm records destined for the school fete was stored in the staff room. One day our biker friend crept up behind someone and smashed a record over his or her head. We discovered this was painless but dramatically noisy and left very satisfying shards of black shellac everywhere. So we spent the lunch hour working through the records, not excluding any students who were foolish enough to knock on the door. I was so naive, really. I had a class of Year 9s who were variously, well, retarded, or should I say differently abled. One of them had also been dealt a bad hand when it came to personal appearance, but was actually rather nice though occasionally given to rages. On graduation he found a job in a sheltered workshop. Pleased with my wit, I recounted the story to my colleagues. “You’re so athletic, Neil,” a female teacher who later went on to considerable fame remarked. My embarrassed blush lit the room beautifully. Honestly, governor, I meant no double-entendre! … more, possibly not scandalous, next post. In February my friend Graham, who was an Inspector of Schools and architect of the 1972 English Syllabus back then, turns 80. There will be a bit of a who was who of English teaching in the 70s and 80s at that gathering. I might add in one of those continuities that Mr R (right in school excursion mode) met G some nine or ten years back. I wonder if R is now starting a Wollongong decade of his own? I rather think he might be onwards and upwards before the current decade is out. Mr R’s decade begins in a very different educational and technological environment. Evidence of the latter is dramatically noted in Internet 2009 in numbers – thanks to Adrian Phoon for that one. In 1970 we had chalk, for writing with and for throwing at students when their attention wavered – probably grounds for assault nowadays – and we had Gestetners and Fordigraphs. By the end of the decade we had reel to reel videotape, then VHS or Beta, closed-circuit TV, cassette recorders, calculators, and sometime in the mid-70s I spotted the first computer in a school. It rather terrified me, a state of affairs that was to last at least another two decades! By the end of the decade I had a new teaching subject: Photography. We also had the cane at the beginning of the decade: 1970 was the only year I ever used it, and that because as Year 8 “Master” at Dapto I was obliged to. By the end of the 70s I had qualified to be a Head of Department — though, aside from an honorary Head of History status for a while at TIGS, I never was one. I was on the state council of the NSW English Teachers’ Association, and was secretary of the South Coast branch. I had organised and/or participated in several staff development conferences and HSC study days. But there is more to a memoir series than such facts, and the CV is ever a poor indicator of what really happened, isn’t it? To quote Jim Belshaw, who was up with the lark this morning: “It’s just coming up on dawn. Yesterday was a hot day, today is expected to be more so. They are talking about 43c, 109.4F. That’s quite hot.” Indeed it is. This morning too (our time) Ramana in India posted Doubts And Regrets. …“A man is not old until his regrets take the place of his dreams.” – Yiddish Proverb. I have learnt to like or at least accept what I attract rather than attract what I like. That enables me to live now without doubts and regrets leaving both to others to handle to the best of their ability. They can chase their dreams and spend a lot of money on all the books, tapes, videos, blogs etc that sell “The Secret” and the “Law of Attraction.” I shall watch the fun and chuckle. Now for all those sixty plus readers of my blog, here is something that each of us would like to sing and for those younger, you have some catching up to do. And so spurred too by Mr R on Facebook as he is about to teach in Wollongong (as I did long ago) I have been on an archaeological dig and have uncovered some of the great highs, and lows, of my teaching career. As for Mr R, a SBHS ex-student and great friend, I was struck by this remark of his: “I am creating the future here!!! !” Whether tongue-in-cheek or not one can never be sure with Mr R, but that’s true for teachers anyway, at least up to a point. Quite a few of my Facebook friends — not that I have anything but a modest collection — are ex-students, and one, Craig Donarski, goes all the way back to my Wollongong days. So too does my friend Simon H, mentioned on my blogs from time to time, whom I first met in 1970. Of course my oldest ex-student (from Cronulla) turns 61 this year! 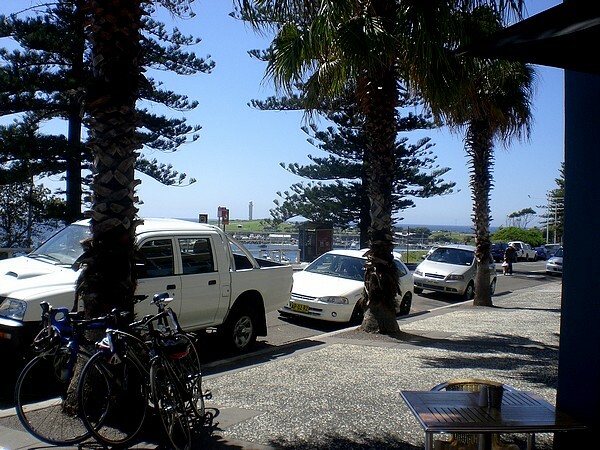 Here is a snapshot from my last year in Wollongong. J opens the door. He has just moved in, a year in America behind him. He will be a writer, is starting a course, will live alone not answerable to anyone for who he is what he does. He has been painting: the walls white, the furniture brown. – Hi, J. It seems we’re neighbours. Rosemary rang me from Wollongong and told me you were here. I’m living just around the corner. – Really! Have you been transferred? – Yes, to Simmons Street. – That’s a good school isn’t it? – Well… nice to see you. Would you like to come in? Sorry about the mess. – What mess? You’re a model of neatness. You should see my place, books and boxes everywhere. No prize for guessing who Mr Smith is, or that Simmons Street is Fort Street. I took the name from “Brian James”, The Advancement of Spencer Button (1950), a bit of a classic and still one of the best (satirical) novels on teaching in NSW. — continues in the next post. Dare I quote Mr R from Facebook? Wollongong: beach, bike path, burger. Not bad! Perhaps near where Sirdan and I were on our Wollongong/Kiama reconnaissance. Yes, a photo I hadn’t used yet. Found another old post which testifies to the brilliance of one recent graduate from the selective school down there. From what I can see Mr R will be hard pressed to beat the experience I gather he has had at CPAHS; sometimes a new school can have its time of readjustment. There’s a sense in which you have to reestablish yourself each time you take up a new appointment. I have to admit though that Mr R is way ahead of where I was in so many ways, when I think back to January 1970. I will certainly be eager to hear of his progress.